Michelle Claville holds a B.A. degree in English, a B.S. degree in Chemistry, and a Ph.D. in Chemistry from the University of Florida (UF), Gainesville, Florida. After four years as a Senior Research and Development Chemist at Albemarle Corporation, Baton Rouge, Louisiana, she went to Southern University (Baton Rouge) as an Assistant Professor of Chemistry where she taught all undergraduate and graduate courses in Organic Chemistry. In 2008, Dr. Claville earned promotion and tenure, became Chairperson of the Department of Chemistry, and received the National Science Foundation (NSF) Faculty Early Development Career (CAREER) award. 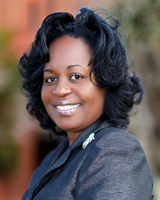 In 2011, she transitioned to Hampton University to assume the position of Assistant Dean of the School of Science. This year, she was awarded a three million dollar grant from the NSF's HBCU-UP ACE Implementation program. Dr. Claville has nurtured scores of students into professional schools, graduate schools, or industrial careers. Together, with her research protégés, she has given over 40 presentations. She engages in research activity pertaining to (1) generation and fate of distonic ions derived from methionine-containing compounds, (2) singlet oxygen derivatization of furan-containing pharmaceuticals, (3) mechanistic studies of cleavage of caged-adenosine triphosphate, and (4) structural analyses and potential applications of haloalkyltrialkylammonium salts.